What’s the biggest benefit a Microsoft Project user gets from using the Do’s and Don’ts guide? Do’s and Don’ts walks the user through the phases of a project sequentially. It identifies what should be focused on, why, how, and when. This approach empowers readers, rather than overwhelming or confusing them. What levels of Microsoft Project expertise would benefit from having the Do’s and Don’ts reference on their desk? Seasoned, skilled users of Project have memorized how to use the software in their work environment. New users have not. That fact meant that I could not write for only one skill level. When I wrote Do’s and Don’ts, I wrote for all levels of proficiency. Microsoft Project Do’s and Don’ts captures the features that are needed and common regardless of user proficiency. New users will find features, techniques, and practices that will serve them well as their skill increases. Seasoned users will find reminders that help them maintain their skills. How did you decide what to “not to” include in this book? If a feature was attractive to a sub-set of the Project user community, I excluded it. For example, earned value techniques and master projects were left out because they are common topics only to more experienced users. There was a size consideration. One of the design requirements was high portability. Over time, I think that some of the excluded topics will make it into the book. Agile, Scrum, and Kanban are examples of topics that are growing rapidly in practice and need consideration when the guide is updated. Can a project manager leverage this very concise book and still create professional looking reports? Yes, project managers should be able to follow the topics sequentially, and as a result, create a well-formed project schedule. They should be able to resource load, track progress, and report on progress according to schedule, work, and cost. If you had to only pick one thing, what specifically about Do’s and Don’ts makes it work? It’s the fundamentals and the step by step approach. The order of information gives the reader a road map to create a well-formed project schedule. What can a user learn in Microsoft Project Do’s and Don’ts about setting up an Agile project in Microsoft Project or Microsoft 365? Project was created long before Agile techniques. Project users have some Agile tools available depending on the version used. Project Pro for Office 365 Premium users, Project Online Users, and Project Web Access users have Scrum templates, Kanban boards, and other Agile tools that not available in Project as a desktop tool. There are workarounds for Project that help the Agile practitioner. I have included these in the updated, second version of Microsoft Project Do’s and Don’ts. Yes, the book now has a new chapter on Agile, and in this chapter, I introduce and illustrate Agile tools available to all users (not just those using Enterprise). What does the workbook and online training provide beyond what’s in the book? Great question! I’ll be specific here. The workbook consists of exercises that reinforce what is learned in each chapter. I do this by using projects that the reader creates step by step. Each exercise uses a project file from the previous one. I have also included each exercise’s answer files for users who wish to go through the material non-sequentially. To make it even easier to follow, I have also created a short video for each chapter illustrating the skill or feature being discussed. After working at Microsoft for many years and then becoming a valued partner, is there any inside “secrets” you can share? Keep it simple. Use Do’s and Don’ts as a reference to build your skills. Place your attentions where it’s needed. If your organization does not allow or require cost, focus on what is required. Build a body of knowledge in the organization and tap into it. Support yourself! MPUG has a vast number of resources available to its membership. Can this book help users to become better project managers or just better with Microsoft Project? That is another great question! I have heard this assumption made for decades. A statement made such as, “Pat is very skilled at using MS Project. Pat must be a great project manager!” The truth is one fact does not equal the other. Microsoft Project Do’s and Don’ts includes project management techniques and the best practices that can support them. The focus of the book is how to use Project within the project management discipline. 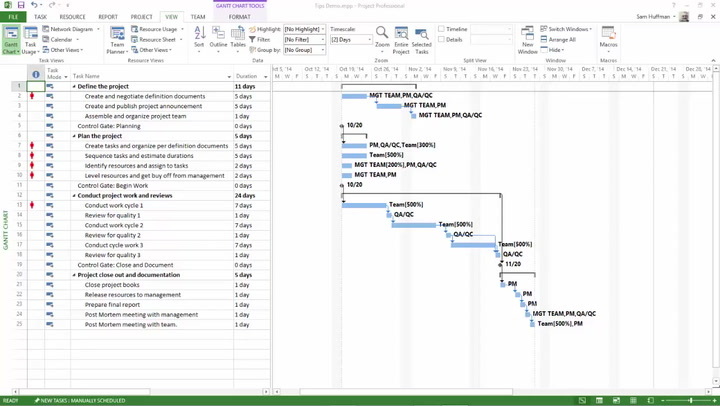 What is the biggest pet peeve you have about using Microsoft Project? I have three, all of equal importance. I would like to see many more baselines and the ability to label each. The Change Working Time dialog could use a modern makeover. More Agile tools and templates would be very helpful. Any tricks you can share as a professional project manager? My favorite trick is to use groups to provide an alternate way of organizing and reporting information. I have several examples in MPUG articles, my blog, and in the updated Microsoft Project Do’s and Don’ts. I wrote the book to fill a niche. I wanted it to be affordable, concise, and transportable. MS Project is a wonderful tool, but it’s depth can lead to the assumption that reference books have to be huge and cover every facet of Project to be useful. Do’s and Don’ts is different. Do you think Santa might use Microsoft Project? I think he does. When you think about it, Santa has most of the elements required for managing a large project: strong leadership, high performance teams, clear final goal, clear schedule, parts and supply management in place, and clear understanding of expectations. I’m sure that risk management is also a factor due to all of the international boundaries he crosses. And due to the speed of project delivery, I’m pretty sure he uses a Kanban Board to manage workflow and get a grip on performance. My next meeting with Santa will be in December to discuss items I intentionally left out of the first edition of Microsoft Project Do’s and Don’ts. I have heard he wants to share his appreciation with me for publishing an excellent Christmas gift that is compact, transportable, and can be easily distributed to all good project professionals around the world. After the first of the year, I may move on to the Easter Bunny and many other international holiday icons to aid them in their projects.